"To me, ascending from the ant's-eye view to the God's-eye view of physical reality is the most profound challenge for fundamental physics in the next 100 years." ​Nobel Laureate Frank Wilczek: Physics in 100 Years. Physics Today 69(4), 32-39 (2016). ​The nature of physical reality determines the game of physics. Currently, the game of physics is like chess with pieces that move through space according to a computer program. But, this game is in a longstanding stalemate. The book claims the reason for this impasse is that physicists have the wrong view of physical reality, so they’re actually playing the wrong game. Instead of a dynamical universe where the present is explained by the past alone, the authors resolve the stalemate of physics by assuming physical reality is rather a block universe. In their so-called Relational Blockworld, the game of physics is like a crossword puzzle where the past, present and future co-determine each other via “adynamical global constraints,” such as the least action principle. Accordingly, the future is just as important for explaining the present as is the past. Not only does this approach resolve the impasse of both philosophy of physics and theoretical physics, but it provides for an explanation of time as experienced. "This book is likely to become a crucial resource for future scientific revolutions, despite (or due to) its daring speculative proposals. Indeed, it offers no less than a complete redefinition of science and explanation, abandoning causality in favor of global consistency. By involving consciousness from the outset, instead of vainly wondering what is its 'material cause', it paves the way to a truly complete view of the world. No aspect of 'what there is' is left aside in this comprehensive book that synergizes physics with philosophy, our knowledge of nature with our knowledge of ourselves." "Einstein was worried about the exclusion of the 'now' from physics. Perhaps one should worry less. After reading this book an idea deeply grounded in physics emerges: complementary to our subjective experience, 'presence' and 'passage of time' are universal and fundamental properties of reality." "This important book drives a well-crafted stake through the heart of the dynamical view of time. The dogma that physics doesn't need philosophy is another welcome casualty." "This book presents a fascinating scientifically informed original metaphysics of nature sure to provoke discussion. And with the price of admission you get a set of wonderfully clear introductions to the cutting edge of modern physics." "From relativity and quantum mechanics to consciousness, Silberstein, Stuckey, and McDevitt, take us on an exciting cutting-edge tour of one of the greatest mysteries in science: the nature of time." "A tour-de-force on physics and philosophy by a philosopher, a physicist, and a mathematician, Beyond the Dynamical Universe is a bold attempt to do away with the standard explanatory paradigm in physics and replace it with a form of blockworld adynamical explanation that might have been inspired by the heptapods in the movie Arrival. It’s a revolutionary proposal, with consequences for the nature of time and our perception of time, worked out in some detail in separate threads for the non-expert, the philosopher of physics, and the physicist. Well worth a serious read, the book succeeds in being both provocative and instructive on many levels." "This book is innovative in form and content. 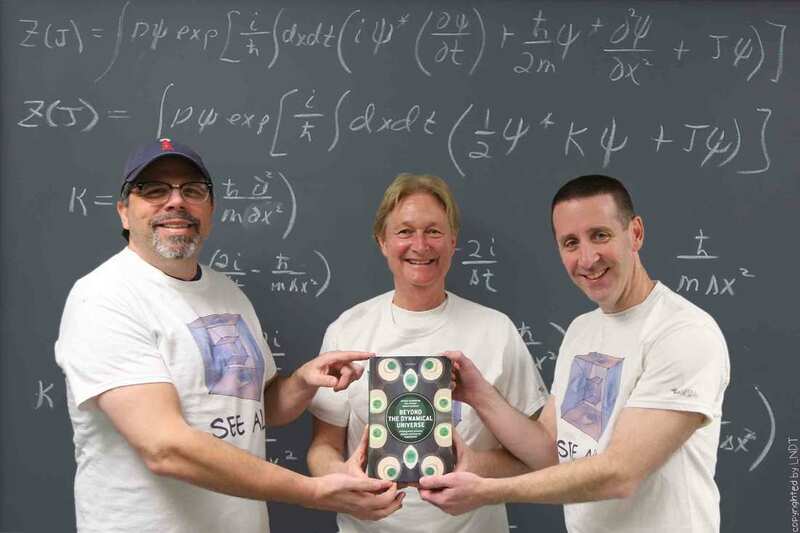 The form—a physicist, a philosopher and a mathematician contributing parallel and interrelated threads on the same topic—is an exemplary model of interdisciplinarity in the foundations of physics. The content—an adynamical, atemporal approach to solving the long-standing conceptual puzzles about quantum mechanics—is a radical departure from standard modes of physical explanation, and one that just might give us genuine insight into the nature of the quantum world." "The book is an original and far-reaching attempt to bridge the gap between the physical image of time, presupposing a static view of a universe given in block, and our dynamical experience of passage, based on our perception of events coming into being in succession. To the extent that the essential task of philosophy is to achieve a unified view of the physical universe and of our place in it, this book is an absolute must for scientists and laypeople alike. You simply cannot put it down."